Eric Rollison Eric Rollison is the Engineer of Reliability Assessments at the North American Electric Reliability Corporation (NERC). Eric began working at NERC in April 2009 and joined the Reliability Assessments and Performance Analysis Group in July 2010. He previously was an Engineer in the Compliance Enforcement group within NERC. Prior to joining NERC, Eric worked for five years as both an Engineer and Project Manager in the Aerospace and Defense industry. He focused his efforts on improving Power Systems for the Pratt and Whitney PW4000 Turbofan engine, and improving sensor technology on the General Electric’s GE90-115B and GEnx high bypass Turbofan engines. 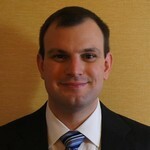 Eric is currently the day to day Project Manager of the NERC’s Geomagnetic Disturbance and Smart Grid Task Forces. Additionally, Eric is the Project Manager for NERC’s Seasonal (summer and winter) Assessments, which are released in May and November of each year. Eric holds a Master’s of Science in Finance from Temple University, Philadelphia, PA received in January 2009, and holds a Bachelors of Science in Mechanical Engineering from Villanova University, Villanova, PA received in 2001. Eric is currently a member of Institute of Electrical and Electronics Engineers (IEEE) and the American Society of Mechanical Engineers (ASME).